So Dean Takahashi of GamesBeat tried the demo of Cuphead at gamescom a couple weeks ago, and he was so terrible he spent twenty-six minutes and couldn’t even complete the first level. I’m not going to link the video and give them more traffic, but it’s not hard to find with a YouTube search. The fact that it’s uploaded to the VentureBeat website shows that they’re really not embarrassed about the video, that they only care about the ad revenue earned through site traffic. I don’t know why people still find this sort of thing surprising. Polygon pulled the same stunt last year with id Software’s Doom. They also uploaded it to the official Polygon channel, where over a quarter of a million people watched it. Last month, we passed the third year anniversary of GamerGate. This is, supposedly, the event that taught gamers all across Reddit that the games media was garbage and couldn’t be trusted. Yet with the way some people act, one would think that they have the memory of a goldfish. Some other sites have tried cashing in on this latest controversy by writing articles contributing to the “debate” over whether games writers need to be skilled at video games. But the sad truth of the situation is that they don’t. Sure, I wish that it was one of the required skills to get hired, but I also wish that the Dragon Quest games had found the same success in the US as they enjoy in Japan. Some things we wish for just aren’t ever going to happen. No, in our flawed and imperfect reality, the only skill that one needs to have to write for a professional video game blog is the ability to write quickly. A game writer must be able to churn out article after article each day. 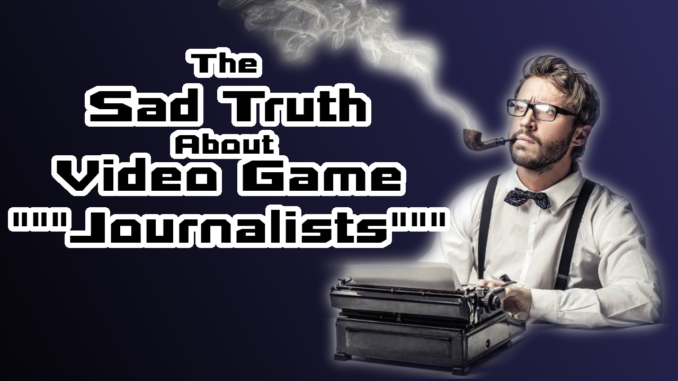 They do not need to be skilled at playing games, or even knowledgeable about the subject matter of their articles. All that matters is that they be able to write enough articles each day to keep their site out of the red. And despite this being well known for years, despite books being written about the subject, people still assume that these writers are supposed to hold themselves to a high standard. Trust in the media is at a historical all time low, yet people still expect these writers to hold themselves to a high standard and act surprised when they don’t meet said standard. Now I’m not apologizing for these writers. I will say outright that each and every one of them should be out of a job. The few decent human beings that write for pay per click sites would be happier and richer if they found work elsewhere. Stop calling the people who write for pay per click sites journalists. They are not journalists, they do not do real journalism, and they certainly do not hold themselves to the high standard of a journalist. They know as much about real journalism a Gender Studies major knows about real biology. Call them what they are. Call them click-bait writers. This drags them down to our level, where now a blue collar worker is higher up on the food chain than they are. To be a journalist, you have to perform investigations and ask hard questions. But the only skill you need to be a click-bait writer is the ability to write fast. Your articles don’t even have to be readable, so long as you trick enough people into clicking on them. Advertisement revenue across the internet is drying up, and these click-bait sites are the reason why. If no one’s going to stick around to read the full article because it’s so poorly written, they certainly aren’t going to look at the banner ads. Buying ads or investments from a click-bait site is basically throwing your money down the gutter at this point. This video by GamesBeat is just the latest manufactured outrage. The sooner people stop falling for it and start calling it what it is, the sooner it’ll stop.